Just as majestic as the home from which its name hails, the Montpelier swing set will go down in history for its endless hours of fun. 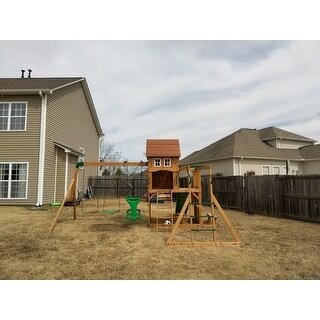 As one of our newly improved wooden swing sets for backyards, this one has all the features of a beautiful mansion: the upper discovery kids fort with its peaked roof, full door and bay windows provides plenty of play space and plenty of style; the front sun porch doubles as an extended deck and launch pad for the 8-foot turbo slide; the monkey bars and ladder present fun access points into the playhouse. Swing into luxury on the belt swings and two-person glider, while the others retreat to the snack stand with built-in bench or sandbox area for some relaxing recreation on their historic sprawling estate. The Montpelier is made from 100-percent cedar. With small, tight knot structure, your lumber will be less likely to develop small cracks emanating from knots. In laboratory testing, our durable cedar wood proved to be rot resistant and highly resistant to natural decay. All lumber is pre-stained for a smooth and clear appearance, as well as cut and stamped with the part number to help speed up the building process. Some pilot-hole drilling may be required. Our exclusive Safe-T-Fuse hardware makes assembly easy and secure. Its laminated swing beam is built strong, with steel clam-shell brackets to ensure that swinging is always safe. Assembly requires two moderately skilled people 12-14 hours. Please note that this product is delivered via LTL Carrier, Curbside. Additional fee s will apply for threshold or white glove delivery service. Please note that this product is delivered via curbside LTL (freight) carrier. Additional fees will apply for threshold or white glove delivery service. It definitely took two skilled adults about 20 hours to assemble this (my neighbor and I). Very quality product. A similar structure was $*** at ***, so I feel this was a very good deal. It does come completely flat in two boxes, this is not for the faint of heart. My kids love it and play hours on it everyday, ages 4 and 6. Great swing set. Only negative thing I have to say is directions aren't very clear at times. Make sure to read ahead before completing each step. I was missing the set of screws for the monkey bars and called Backyard discovery. After waiting for 30 minutes, they 2 day shipped the screws to me for free. Very satisfied with this product. They have done some modifications based on other reviews. It is very stable now. I have a rambunctious 6 year old boy and 9 year old daughter that play hard. It doesn't move but shakes a little when they swing. Monkey bars and slide hold up well. I would suggest, like others, to organize the parts the day prior to starting and have at least one person to help. Read each step thoroughly. We had to redo the roof because we forgot a part and also a brace for the clubhouse wasn't specific. The kids should be able to use this for many years. kids love the swing set!!!! 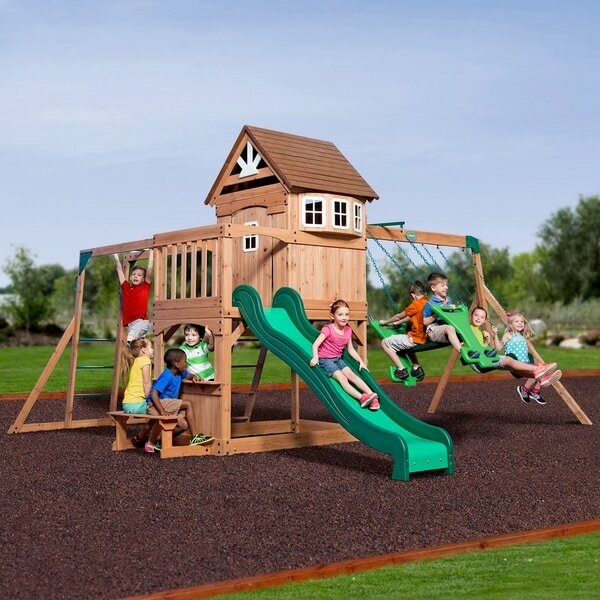 Kids absolutely LOVE this swing set! They can spend all day playing on it. Assembly was fairly easy, but it does take a couple of people. Love the all-cedar construction. Will last our family years and years. This took a long time to put together. Every piece except two were marked, but there are so many individual pieces it helps to spread it out across a garage or deck floor before you start. I managed putting it together alone in about 10 hours across two days. The quality is fairly decent for what you pay, a few boards had some warps to them and a couple were split, but overall it looks like it will last. It does appear larger than it is in the picture. My 3 and 5 year old pass through the house with no issues, my 8 year old is crouching down. Wouldn't be an issue except the path to the slide is through the house and its awkward as the door only swings in, and that blocks the stairs when its open. The screws to the door hinges are the cheapest tiny screws I have seen. Look like eyeglass screws. A better design would be a pass through hinge bolt with washers on either side. I will be replacing ours with that as two of the six screw heads already snapped from a week of use. The kids are enjoying it, now if I could only get that ceder smell out of my garage. I would recommend this swing set to anyone who's children are under 8 years old. i have 3 young ones and they absolutely love this. ive had it for 4 years already and its still holding strong. the only bad thing was the door to the play house, it was just placed horribly, so we completely took off the door and its better than it is with it. the door was pretty much in the way of playing. but other than that, its a great, sturdy, product! We were super excited to get this delivered. We had to hire someone to put it together. It comes in individual wood slabs and lots of little pieces and parts! My children have enjoyed it, but the product is cheaply made and the wood is super thin. It did not last long at all. We have had this for a year and it is breaking down, big time. The door has been replaced numerous times and there are wood cracks. I am getting nervous it is no longer safe for my kids. Expensive product for only a year and a half use. I was skeptical when ordering this based off some of the negative reviews but after comparing what this set had to offer with a set I could buy locally, this was about half the price and offered more. I received it less than a week after ordering and put it together in about 10 hours with the help of my 2, 4 and 6 year old. The doorway is a little small for the 6 year old, but he hasn't complained. I intend on enclosing the bottom section with a bigger door for him in the future. The directions were easy to follow and came with extra hardware. Its way sturdier than I thought I was going to get based on the price. I would highly recommend this playset. Wood is very thin, several pieces cracked. some of the pilot holes were drilled wrong, some of the boards were not labeled, some boards were bowed, overall just not very pleased with the quality. I made it work anyway. If I had it to do again I would purchase a different brand, possibly spend more money. Took me about 4 days to build by myself. It’s holding up well. This was a gift for my five year old for Christmas. My husband and his friend spent two days putting this swing set together. My daughter has played on it every day since and she loves the slide and area with bench, where she can serve "tea"
This play set is a great size and can handle multiple adults on it once it is anchored. Came in with no missing hardware or pieces, has had the neighborhood kids on it at all points and have not had any issues. Instructions where clear and easy to follow and all the wood had the correct identifying markings. The instructions were easy to follow. With friends help, we were able to put together in one day. It does seem slightly smaller than expected, but our kids love it! 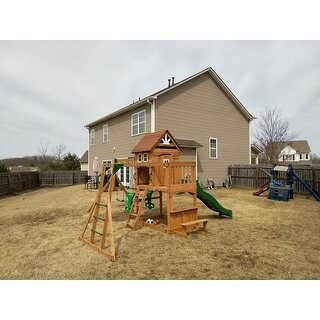 Everything is good quality, the only area we had issues with is the door to the playhouse. The screws popped out and we had to redo with our own. Having bought this I must say that if there’s an option to have It put together take It. Way too many parts and It takes about 3 days (specially if you are OCD). One complaint I have is that no matter what we tried the house ended up slanted. But other than that the playground looks pretty awesome. "Is this set stable without installing the swing portion? Only the playhouse, ladder, slide, and monkey bars." The set must be installed as directed to assure that safety is built in. Any modifications will void the warranty. "Does everything come with this set"
"What are the dimensions of the actual clubhouse portion?" The upper club house is approximately 65.75 inches tall x 50.3 inches wide x 66 inches deep. "How long has everyone had theirs ? " "How many monkey bars come with this play-set? " 3 if the picture on the assemble instructions are accurate. "How long is the slide?" "Why is it pictured with monkey bars if they are not included???" Good afternoon, The Montpelier does come with monkey bars as shown in the picture. Christmas toys for boys should spark creativity and provide hours of fun. This Christmas, get your son, grandson, nephew, or little brother a cool toy that encourages his imagination and makes him happy. Keep reading to find the perfect gift for any boy on your Christmas list. Buying gifts for tweens is fun because at this stage their interests are deepening, growing, and changing. We've created a list of the best gifts for tween girls and boys to help you get the ideas flowing. When it comes to creating a magical Christmas morning, start things off right with stockings loaded with gifts picked just for your children. We've come up with a list of the top toddler Christmas toys for both boys and girls that will bring learning and laughter for years to come. These toys will help your child explore their world and expand their imaginations. From rocking horses to small-scale motorized cars, ride-on toys not only satisfy a young one's need for speed, but they also encourage outdoor activity and build confidence. If you're looking for ideas for the little ones on your Christmas list, consider these suggestions to find a perfect gift. Are you looking for the best toys for girls this Christmas? Be sure to put a few of these top gift ideas on your shopping list. Shop our huge assortment of toys at Overstock.com. Best Toys for Kids Ages 10-12 from Overstock.com. No matter what the hot toys are this year, the best toys for tweens always have these great qualities.